BARCELONA, Spain -- Samsung Electronics has made significant progress in its 5G technologies and the tech giant is expected to produce a 5G phone in the “not so distant” future, according to Chief Technology Officer Park Jin-hyo of SK Telecom. “It is not so far for Samsung either in coming up with a 5G device,” Park told The Korea Herald while attending the Mobile World Congress 2018 on Monday in Barcelona, Spain. The comments came as China’s up-and-coming Huawei announced its first 5G chipset Balong 5G01 prior to the opening, and plan to launch a 5G smartphone in the second half of this year. “Huawei excels in its technologies…While Samsung may not say much, it has also been making a lot of preparations,” Park said without elaborating further. There has been wide speculations in the industry that Samsung’s next flagship S10 will be the mogul’s first 5G phone. If on schedule, Samsung’s S10 is to be released early next year. The Samsung 5G devices served as a platform to control 5G services prepared by KT through the mobile carrier’s 5G radio base station in PyeongChang. 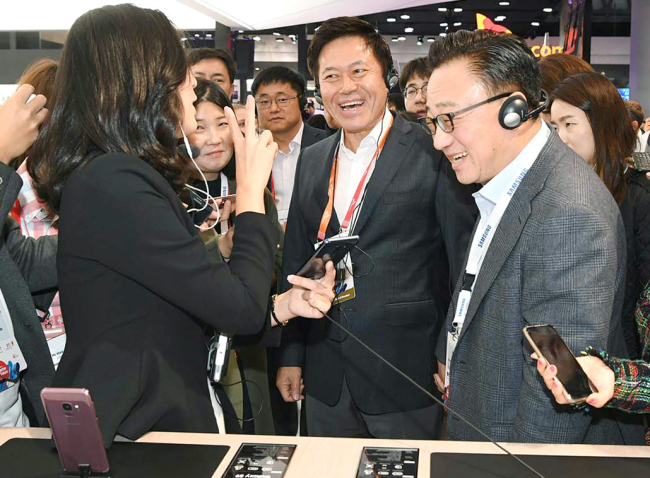 At MWC, Samsung has teamed up with SK Telecom to showcase making a 360-degree video call based on a pilot 5G network established in cooperation with Samsung Electronics at its booth.